Does Niu-t'ou Need the Flowers? Niu-t'ou Fa-jung (594-657) was of the Wei (韋) family and a native of Yen-ling (延陵) in Jun-Chou (潤州), present day Chen-chiang in the southern part of Kiangsu Province. Fa-jung is the founder of the The Ox-Head School (牛頭宗) of Ch'an Buddhism. The name "Ox-Head" (Niu-t'ou) come from the Mount Niu-t'ou (Niu-t'ou shan) where Fa-jung lived. He is also known as Niu-t'ou Mountain (Temple/School) First Patriarch Ch'an master Fa-jung (牛頭山初祖法融禪). The Ox-Head School is considered not belonging to the orthodox line of Ch'an. This line of Ch'an sect is also known as Niu-t'ou Zen (牛頭禪). Under Tao-hsin (580-651), the fourth patriarch, Zen was divided into two branches. The one known as Niu-t'ou Shan, did not live long after the passing of its founder, Fa-jung, who lived at Mount Niu-t'ou, and is considered not belonging to the orthodox line of Zen. [. . .] Tao-hsin's interview with Fa-jung, the founder of the Niu-t'ou school of Zen, was significant, showing where their views differed and how the one came to be converted into the orthodox understanding of Zen. It was during the Chên-kuan era of the T'ang dynasty that Tao-hsin, learning of the presence of an extraordinary saintly man in Niu-t'ou mountains, decided to see who he could be. When Tao-hsin came to a Buddhist temple in the mountains he inquired after the man and was informed of a lonely anchorite who would never rise from his seat nor salute people even when they were approaching him. When Tao-hsin proceeded further into the mountains he saw him as he was told, sitting quietly and paying no attention to the presence of a stranger. He then asked the hermit what he was doing here. 'I am contemplating on Mind,' was the reply. Tao-hsin then demanded: 'What is he that is contemplating? What is Mind that is contemplated?' Fa-jung was not prepared to answer such questions. Thinking that the visitor was a man of deep understanding, he rose from the seat and saluting him asked who he was. When he found that the visitor was no other personage than Tao-hsin himself, whose reputation he was not ignorant of, he thanked him for the visit. They were now about to enter a little hut nearby where they might talk about religion, when Tao-hsin saw some wild animals such as tigers and wolves wandering about the place, and he threw up his hands as if he were greatly frightened. Fa-jung remarked, 'I see this is still with you.' The fourth patriarch responded at once, 'What do you see yet?' No answer came from the hermit. After a while the patriarch traced the character 'Buddha' (fo) on the stone which Fa-jung was in the habit of sitting in meditation. Seeing it, the latter looked as if shocked. Said the patriarch, 'I see this is still with you.' But Fa-jung failed to see the meaning of this remark and earnestly implored to be instructed in the ultimate teaching of Buddhism. This was done, and Fa-jung became the founder of the Niu-t'ou school of Zen Buddhism. Why try to look for it? Why talk about smoke and fire? Clinging to what you’ve known— don’t bother. All these things are useless. In a place of quiet illumination, see for yourself. What is past is empty. Stuck in knowing, you confuse the teaching. Your clarity is still lost in darkness. And are illuminated in turn. You must only use the effort of no-mind. This is the most subtle point. Not knowing is all the knowing you need. You haven’t yet avoided sickness. Always be with what is right in front of your eyes. Be completely with that nothing. This itself is the mysterious void. If the first thought doesn’t produce it. And this is where your without-thinking mind will emerge. This is the source of so many afflictions. To seek the truth while turning away from the teachings. You will be full to the brim with pure illumination. When you’re protecting an infantile way of thinking. You’ll see how erroneous views pervade the world around us. In a dark place, not moving. In the place of quiet you will find the brightest illumination. All arranged in a network, of one aspect. And no one going there. Keep this mind and don’t look for another. Don’t try to cut off your cravings and lust. So let it appear and disappear naturally. And thus you will see your original mind. Does not require you to hold on to anything. Your afflictions originally do not exist. You don’t have to do anything to get rid of them. The ten thousand dharmas return to this point. Cut off perceptions and forget about grasping. The Buddha’s three bodies have always existed. but this discrimination is not the only kind of consciousness. That tames and corrects the ten thousand conditions of karma. It stays in one place and cannot be led astray. Accords with any situation, and doesn’t draw attention to itself. Enlightenment is originally not enlightenment. It becomes “enlightenment” when it’s no longer enlightenment. Who can call them “good” and “bad”? Are originally nonexistent and unmade. There is no sickness and no medicine. In times of confusion, let go of the things of this world. Enlightenment-ceasing is not different from this. So why should we throw anything away? To say “it exists” is demon speech. To say “emptiness” only resembles what’s appropriate. Don’t try to extinguish your unenlightened thoughts. Only instruct yourself to rest your thinking. Mind will be extinguished by non-effort. By itself it illuminates everything. Enter the principle with a mind of deep mystery. Allow your mind to see all that arises. And in those arising objects the mind itself will disappear. Mind and objects collapse into each other. They are now one and the same. The mind is also extinguished by objects. Leaving only quietness, calmness and bright emptiness. So don’t keep any $xed address. And you’ll never think about it again. Endless day is like night. Endless night is like day. Inside, your mind will be empty of all truths. This is the strength of a great person. And will bring chaos to your spirit. Moving, stopping, moving—it all drains away. In reality there is not even one thing. Apart from mind there is nothing. True emptiness is not emptiness. And all vehicles embrace this teaching. As the sands of the Ganges. Only a quieted mind with no place to rest. Opens itself to bright emptiness. It is always there, a broad, vast liberation. And it will all remain in harmony. A light whose brightness never goes away. A citadel of bright nirvana. You can try to explain them in spiritual terms, to understand them in material terms. But don’t put up a platform for teaching the dharma. Close your eyes and rest in the house of emptiness. Is found in the nature of things as they are. all comes from not manifesting the self. all come together in the One Vehicle. then it will be no di"erent from the dharma. Always exist at the same time. There is nothing that can possibly be explained. CDC - "Chodang chip". Yanagida version. CKL - "Chueh-kuan lun". Tokiwa version. CSTP - "Chin-shih ts'ui-pien". Shanghai, 1893. CTL - "Taisho version, 2076". CTS - "Chiu T'ang-shu". Peking, 1978. CTW - "Ch'uan T'ang-wen". Taipei, 1960. HKSC - "Hsu kao-seng ch'uan", T. version, 2060". HM - "Hsin-ming". CTL version. HTC - "Hsu tsang-ching". Lung-men reprint. HTS - "Hsin T'ang-shu". Peking, 1978. JCP - "Journal of Chinese Philosophy". JIABS - "Journal of International Association of Buddhist Studies". PEW - "Philosophy East West". TWT - "T'ang-wen ts'ui". Taipei, 1973. Taisho 2076. Compiled by the monk Tao-yuan (n.d.) from the Fa-yen School in 1004 a.d.. The work was published in 1011 a.d. Biography in HKSC (T. 2060) ch. 26, pp. 603c-605b, in CDC ch. 3, pp. 51a53a, and in CTL ch. 4, pp. 227c-228b. For a translation of Fa-jung's biography from CTL see Chang Chung-yuan: Original Teachings of Ch'an Buddhism. N.Y., 1969, pp. 3-11, 17-26. For a modern treatment in Japanese of Fa-jung and his teaching see Hiromine Kinami: Gozu-shu ni Okeru Ichikosatsu. In: IB XXVIII, 1, 1979, pp. 186-87 (1) and IB XXIX, 1, 1980, pp. 146-47 (II). The most comprehensive study so far in a Western language is John R. McRae's The Ox-Head School of Chinese Ch'an Buddhism: From Early Ch'an to the Golden Age. In Studies in Ch'an and Hua-yen, ed. by Robert M. Gimello & Peter N. Gregory, Honolulu, 1983, pp. 169-252. McRae's article contains a very useful review of Japanese studies of the Niu-t'ou School and its doctrines up to ca. 1979. A description of the mountain and its temples including photoes can be found in Buddhist Monuments in China (Shina Bukkyo Shiseki Kinenshu) by Daijo Tokiwa and Tadashi Sekino, Vol. 4, Tokyo, 1937, pp. 17-19. The mountain was visited around the same time as the Japanese, i.e. in the 1920's, by the Danish architect Johannes Pripp-Moller, who described it in his monumental work Chinese Buddhist Monasteries. Copenhagen & London, 1937, pp. 183, 186, 194. A present day note on the mountain is included in Barry Till's In Search of Old Nanking. Hong Kong, 1982, pp. 75-76. Biography in HKSC (T. 2060), ch. 26, pp. 606bc, in CDC ch. 2, pp. 41b-42a, and in CTL (T. 2076), ch. 3, pp. 222b-223a. For a very thorough treatment of this key-figure in early Chinese Ch'an see David W. Chappell's The Teachings of the Fourth Ch'an Patriarch Tao-hsin (580-651). In Early Ch'an in China and Tibet ed. by Lewis Lancaster and Whalen Lai. Berkeley, 1983, pp. 89-129. Biography in HKSC ch. 16, pp. 551bc, CDC ch. 2, pp. 32a-39a, and CTL ch. 3, pp. 217a-220b. For a modern study on Bodhidharma in Japanese see Bunyû Matsuda's Bodaidaruma Ron. In IB Vol. XXVII, 2, 1978, pp. 595-600, a critically annotated edition in Japanese of the discourses attributed to Bodhidharma can be found in Seizan Yanagida (ed. & transl. ): Daruma no Goroku. Zen no Goroku Series Vol. 1. Tokyo, 1969. See Chappell pp. 103-104, note 11. Biography in SKSC (T. 2061), ch. 14, pp. 790b-791b. He finished compiling the HKSC in 664 a.d.
HKSC (T. 2060), ch. 26, pp. 603c-605b. In this work Fa-jung's biography is included in the hsi-ch'an section. A much shorter biography obviously based on the HKSC version can be found in the work Hung-tsan fa-hua ch'uan (T. 2067), ch. 3, pp. 16c-17a, by Hui-hsiang (n.d.). This collection is dated to 667 a.d., and here Fa-jung is represented as a master of the Lotus Sutra, an indication of his close affinity with the T'ien-t'ai School. Biography in CDC ch. 3, p. 53b and CTL ch. 4, pp. 229bc. Biography in CTS ch. 190 and in HTS ch. 203. For a treatment of Li Hue's Buddhist involvement see the author's MA. Thesis: The Relationship Between Confucian Men of Letters and Buddhist Monks During the Latter Half of the T'ang Dynasty: A Study in Assimilation and Harmonization Between Two Major Spiritual Traditions in China. University of Copenhagen, 1983, pp. 22-26. The title of this inscription is Hang-chou Chin-shan Ssu To-chueh shih pei-ming composed by Li Chi-fu (758-814), CTW Tao-ch'in's biography is in CDC ch. 3, p. 53b and in CTL oh. 4, pp. 230ab. Biography in CTS ch. 160. See also biographical note in CTW ch. 610. This stûpa was built in 774 a.d. during the reign of T'ai-tsung (762-779). A Korean Ch'an (Son) collection of biographies compiled in 952 a.d. by the two Korean monks Chong and Un. For a discussion of this important text see Paul Demieville: Le Recueil de la Salle des Patriarches: Tsou-T'ang Tsi TP LVI, 1-3, 1970, pp. 262-286. See CDC ch. 3, p. 51a, and CTL ch. 4, p. 227a. For a discussion of the monks under whom Fa-jung studied see Hakuju Ui: Zenshû shi Kenkyû. Vol. 2, Tokyo, 1939-43 (reprint 1966), pp. 511-519. One of the earliest structured Buddhist traditions in China based on the madhyâmika philosophy of Nagârjuna (ca. 3rd cent.). Its status as a school of Chinese Buddhism did not arise until far into the T'ang dynasty. For a discussion of the lineage in the San-lun School see Ryûko Furusaka: Sanron Gakuha ni Okeru Sosho Mondai. IB XVIII, 2, 1970, pp. 609-10. For treatments of the San-lun thought and history in English see Hsueh-li Cheng: Chi-tsang's Treatment of Metaphysical Issues. JCP 8 (1981), pp. 371-989, and Aaron K. Koseki: The Concept of Practice in San-fun Thought: Chi-tsang and the "Concurrent Insight" of the Two Truths. PEW 31, 4, 1981, pp. 449-466, and: Later Maadhyamika in China: Some Current Perspectives on the History of Chinese Prajnaapaaramitaa Thought. JIABS. Vol. 5,2, 1982. The latter article is a review article of Hirai Shun'ei's monumental work: Chuugoku Hannya Kenkyû. Tokyo, 1976. One of the important Buddhist denominations in Southern China during Sui-first half of the T'ang period. The impotance of T'ien-t'ai meditation practices in relation to the formulation of early Ch'an Buddhism has still not been thoroughly investigated, however some aspects have been touched upon in recent Japanese scholarship. See Kenju Komatsu: Makashikan no Hoben. IB XXVI, 2, 1978, pp. 826-828. Toshio Kazama: Makashikan to Nanshûzen no Kankei ni Tsuite. IB XXVIII,1, 1979, pp. 51-55, Keisho Sengoku: Nangaku Eshi no Zenkan. IB XXXI, 1, 1982, pp. 256-58. 256-58, two articles by Hideto Ono: Tendai Kanjin Jikiho no Kenkyû. IB XXIX, 1, 1980,pp. 326-332, and Shiki Tendai no Ten Shiso. IR XXIV 1, 1975, pp. 114-118, Rosan Ikeda; Tendai Chigi no Reiho Taikei. IB XXIX, 1, 1980, pp. 37-41, and Kobaku Sakamoto: Tendai ni Okeru Shizen. IB XXXI 1. 1982, pp. 259-262. Important studies in Western languages are Leon Hurvitz: Chih-i, an Introduction to the the and ideas of a Chinese Buddhist Monk. MCB Vol. 12, Bruxelles, 1962; Helwig Schmidt-Glintzer: Die Identitat Der Buddhistischen Schulent und Die Kompilation Buddhistischer Universalgeschichren in China. Wiesbaden, 1982; and Paul Magnin: La Vie et l'Euvre de Huisi (515-577). Publications de l'Ecole Franraise D'extreme-Orient Vol. CXVI. Paris, 1979. See Tokiwa and Sekino pp. 17-19 (also note 5). The first mention of the supposed meeting between Fa-jung and Tao-hsin can be found in Kuei-feng Tsung-mi's Yuan-chueh ching ta-hsu ch'ao (HTC Vol. 14, p. 279b) from 823 a.d. The earlier inscriptions only mention the lineage. See also CDC ch. 3, pp. 51ab. The biographical entry on Fa-jung in CTL mentions that Tao-hsin went to Niu-t'ou Shan in "the middle of the Chen-kuan period" (627-649 a.d.); CTL ch. p. 227a. CDC ch. 3, p. 53a. Biography in HKSC ch. 25, pp. 602ac. See also the above mentioned later stele-inscriptions and the line of transmission as given in CDC ch. 3, p. 53a. This has also been noted by John R. McRae in his The Ox-head School of Chinese Ch'an Buddhism, p. 178. Biography in the stele-inscription "T'ang Ku Kuei-feng hui sh'an-shih ch'uan-fa pei," by P'ei Hsiu (797-870), CSTP ch. 114. For a reprint of the original inscription see "P'ei Hsiu tzu-t'ieh," publ. by Hsi-ch'uan Jen-min Ch'u-pan she, Ch'eng-tu, 1981. See also the biographical entries in CDC ch. 5, pp. 114a-116a and CTL ch. 13, pp. 305c-308b. For a study of the life and Ch'an thought of this important master see Jan Yun-hua: Tsung-mi: His Analysis of Ch'an Buddhism. TP LVIII, 1972; pp. 1-54 for a discussion and complete translation of Tsung-mi's Ch'an-yuan chu-ch'uan chi tou-hsu (T. 2015) see Jeffery Broughton: Kuei-feng Tsung-mi. The Convergence of Ch'an and the Teachings. Ph.D. Dissertation, Columbia University, 1975. T. 2015. p. 402c, HTC Vol. 14, p. 279b, HTC Vol. 110, pp. 436d-437a. Ch'an-yuan chu-ch'uan chi tu-hsu (T. 2015), p. 402c. Ibid. This characterization will appear quite fair when compared with the contents of the Hsin-ming. Biography in CDC ch. 16, pp. 309a-312a and CTL ch. 9, pp. 266abc. For a translation of his yu-lu compiled by P'ei Hsiu, i.e. the Ch'uan-hsin fa-yao (T. 2012) see John Blofeld: The Zen Teaching of Huang Po. London, 1958. Hsi-yun's critique of Fa-jung is found in CTL ch. 9. p. 266c. In the scripture catalogues compiled by Eun (n.d.) (T. 2168AB) and Enchin (814-889) (T. 2169, 2170, 2171, 2172, 2173) we find the titles of the following texts bearing the name of Fa-jung: Chu chin-kang pan-jo ching in one chapter pp. 1088, Chu chin-kang pan-jo in two chapters pp. 1091, Wei-mo ching chi in one chapter pp. 1091, Hua-yen ching szu-chi in one chapter pp. 1151. In addition to these texts several more bear the name Niu-t'ou probably also meaning Fa-jung. If these commentaries actually were written by Fa-jung, it is readily understandable why we find citations from the Vimalakîrti Sûtra and the Avatamsaka Sûtra in the CKL. In Lionel Giles's Descriptive Catalogue of the Chinese Manuscripts from Tun-huang in the British Museum. London, 1957, p. 129 (S. 2944) we find a text called Jung Ch'an-shih ting-hou yin (The Ch'an master Jung's Song Following Samâdhi), which through further investigation might turn out to be a work by Fa-jung too. Yanagida's argument for the attribution of the Chüeh-kuan lun (hereafter CKL) to Fa-jung appears to be well documented and there can be little doubt that the text is from his hand. See Tokiwa pp. 2-3 and p. 23 note 7. See Hsin-ming (hereafter HM) pp. 457b line 2, p. 457c line 2, p. 457c line 3, p. 457 line 12 and p. 458a line 6, and CKL (Tokiwa version) section III, p. 89, section VI, p. 91, section IX, p. 93 and section X, pp. 93-94. Compare fx. the opening passage of CKL with that of Tao-te ching. The "Taoistic" touch apparent in the Niu-t'ou doctrines should not be interpreted to mean that this school of Ch'an was a mixture of Lao-Chuang Taoism (wrongly called Neo-Taoism) and dhyâna Buddhism, but should rather be seen as a genuine Chinese Buddhist interpretation of mâdhyamika philosophy emphasising the practical realization of universal emptiness partly expressed through Lao-Chuang terminology. When seen from this angle, then the Niu-t'ou doctrines constitute a logical and direct continuation of the type of Chinese mâdhyamika evident in such a work as Chao-lun (T. 1858) et al. The CTL as such is admittedly quite late, however the contents of the Fa-jung biography included therein agrees perfectly as far as doctrine goes with that of the HM and CKL, and might very well be at least partly genuine. CTL ch. 30, p. 457c, line 6. CKL section VI, p. 91. Ibid, section IV, pp. 89-90. T. 2837, pp. 1286c-1289b. See also the modern Japanese version by Seizan Yanagida in Shoki no Zenshi, 1. Zen no Goroku 2. Tokyo, 1971, pp. 49-326. It has been translated into English by David W. Chappell in Early Ch'an in China and Tibet, pp. 107-129. 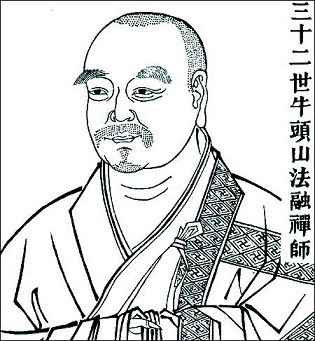 Biography in Pao-lin ch'uan (Zengaku Gyosho Vol. 5), comp. by Seizan Yanagida, reprint 1983) ch. 8, pp. 148-154, CDC ch. 2, pp. 41ab and CTL ch. 3, pp. 211c- 212b. The teaching on the unobtainability of phenomena is identical in the two works and so is that of non-duality. It must be noted however, that the Hsin Hsin-ming has a stronger leaning towards the doctrine of tathâgatagarbha (fo-hsing) than the HM. Biography in the Li-tai fa-pao chi (T. 2075), pp. 185c-196b and CTL ch. 4, pp, 234b-235a. Biography in CDC ch. 3, pp. 56b-57a and CTL ch. 5, pp. 245ab. A biographical treatment in French can be found in Jacques Gernet: "Biographie du Maitre Chen-houei de Ho-tso." Journal Asiatique, CCXLIX, 1951, pp. 29-60. Know anything and the basic principle is lost. Nothing, yet everything is as usual. Substance itself is empty and obscure. The preceding no different from the succeeding. The preceding thought cuts itself off. Out of no-mind they manifest. Can there be leaving and entering? Brightness and tranquillity are just as they are. Nature being empty, lust will depart by itself. “Origin” is the present moment. The three bodies have always existed. Why call either good or bad? There is no sickness, no medicine. Enlightened, it makes no difference. Now what use is there in discarding? Only teach the cessation of thoughts. When mind is gone, action is terminated. Naturally, there is clear comprehension. The profound mind enters into principle. Mind arises in accord with the environment. Within the environment there is no mind. And both will be disturbed. Environment is extinguished together with mind. Mind disappears together with environment. There is tranquillity and limitless brightness. In the eternally clear water of mind. It does not establish closeness and distance. It doesn’t choose its abode. Inwardly mind is empty and real. There are neither people nor seeing. Without seeing there is constant appearance. It has always pervaded everywhere. Sinking and confusing the spirit. And it becomes even more erratic. Yet there is only one door. It cannot be probed by mind. Real emptiness is not empty. All ride on this basic principle. Contains worlds numerous as the Ganges sands. Set free in boundless time and space. Whatever it does, there is no obstruction. Going and staying are equal. The light of samadhi is bright. Shining on the city of nirvana. Spirit is understood and settled in substance. Sleeping peacefully in a vacant room. Wandering free and easy in reality. Relying on nothing, manifesting naturally. Are all on the path of one vehicle. Dharmas will not differ from one another. No words can explain enlightenment. Original Teachings of Ch'an Buddhism. Translated by Chang Chung-yuan. New York: Random House, 1969. pp. 17-26. Fa-yung by a hundred birds. on, "But which one is the man of Tao?" The monk made no reply. "Where have you stayed before?" "I never remain in any one place, but wander either east or west." "Do you know the Ch'an master Tao-hsin?" that I may pay my respects to him." "Tao-hsin is my humble name." "To look for you. Do you have a place where I can stay?" "There is still this in you." "What did you see?" replied the visitor. Fa-yung made no answer. arise from passions that generate karma27 are originally non-existent. anxiety - it is called Buddha." then what is Buddha, and what is Mind?" do you do when mental attitude29 emerges?" free from formulation or conception, how could illusions occur? remained there for the rest of his life. a shortage of food for his disciples and the residents of the temple. to listen. When he came to the section, "Extinction and Quiescence,"
thoughts are produced. The teaching of the truth is not the Truth. What is the use of the instruction of Buddhism?" mind, how does this mental attitude arise?" the eyes are closed. But as the mind is in action, thoughts increase. of the mind. What are produced are simply namable concepts. one cannot be non-attached to birth and death." known. Knowledge in which something is known falls short of this. One should look into one's original nature and not search outside. tracks? So it is with the search for the original nature of the mind. better for it to be brought to quiescence?" manifestations is useless, but a direct approach easily reaches it. mind and words are one is completely wrong." not altered. Production and extinction are then not unnatural. disappear. During the awakening, internal conditions do not arise. or the swift stroke of a sharp sword." then nothing exists outside the mind." search for what cannot be sought. Non-discrimination is real discrimination. From the depth of darkness illumination is revealed. hindrance. Their approach to Buddha is in trouble." one strives for cultivation, one will not realize this difficulty." the Middle Way. The Middle Way cannot be expressed in words. It is that tranquillity which lacks a place in which to be tranquil. How can we determine it by cultivating the mind?" action to find the Truth, and yet he says that action is non-action. to the teaching of Buddhism. Perhaps it can never be understood. by the teaching of Buddha." activity of the mind is brought about by intellectual knowledge. feel as if his mind were covered with a gauzelike garment." does not exist. How can we obtain the truth48 through words?" deviate from the correct path." with the nature of things." well kept even to this day. tathagatagarbha, and alayavijnana (all-conserving consciousness). in 1932 by George Routledge and Sons, London. and religious aspects by the basic concept of sunyata, or Emptiness. text; it was translated into Chinese as early as A.D. 172 by Lokaraksha. commonly used for chanting in Buddhist temples. Verses, or Sata Sastra. The first two sastras were written by Nagarjuna. 4· T. R. V. Murti, The Central Philosophy of Buddhism, p. 226-27.
formative principle; vijnana, or consciousness. 6. Yung-chia, Odes on Enlightenment, in Taisho shinshu daizokyo, No. 2014, Vol. 48, p. 396.
shinshu daizokyo, No. 2013, Vol. 48, p. 391. No. 1854, Vol. 45, pp. 77-115. 9· Collected Works of Ch'an Master Yung-chia, p. 393. School, and Tso-ch'i Fa-lang the Eighth. 12. Collected Works of Ch'an Master Yung-chia, p. 391.
daizokyo, No. 2077, Vol. 51, p. 508. 15. Collected Works of Ch'an Master Yung-chia, p. 391. 16. Daisetz T. Suzuki, Essays in Zen Buddhism; Series I, p. 203. 17. The Dialogues of Ch'an Master Chao-chou, p. 64b. bank of the Yangtze River. achievement of sunyata through detachment from all existence with its multiplicities. Niu-t'ou Mountain, south of Nanking in Kiangsu Province. 23. The li is about one-third of the Western mile. generally believed to be the endowment of the Bodhisattva. 26. Bodhi means the enlightened and illuminated mind. 27. Karma generally means a deed or action which causes its proper result. the formless realm of pure spirit. 30. A town south of Chen-chiang in Kiangsu Province. or the capacity of mind." indicates the absolute state of mind. which rise up and disappear in the realm of quiescence. 38. Capacity of mind of no-mind; see note 33 above. which is both real and unreal, and is neither real nor unreal. and even arrests birds in their flight imd fish in the water. 41. The five gati: hell, hungry ghosts, animals, human beings, devas. the sixth heaven of desire. and non-being are removed. There is neither a real existence nor a real void. 45. See note 5 above. beings and awakens them, which wonder is derived from the Lotus Sutra. is an abbreviation of this expression. Master Niutou Farong came from Yanling in Runzhou (Jiangxi). While still a teenager he became well versed in Confucian classics, as well as Doaist ritual and philosophy, and traditional medicine. Upon reading the Prajna Paramita scriptures he had a deep realization and turned his attention to Buddhist teaching. He went to study with a master of the “Three Treatises” (Sanlun) school on Thatch Mountain and soon received ordination from him (The Sanlun school focused on the Madhyamaka, or “Middle Way”, philosophy from India). Later, Farong went to live in a cave on Ox Head (Niutou) Mountain south of Hangzhou. His reputation for devoted practice began to spread, and, according to legend, he was once visited by Master Daoxin, who came to check out his understanding. Daoxin went over to the rock on which Farong had first been sitting and scratched the character “Buddha” with a stone. Farong raised his arms and gasped. Farong said nothing. Then, after a pause, he asked the master to explain the meaning. Master Daoxin gave a teaching and Farong experienced a clarity that resolved his remaining doubts, and brought his understanding to maturation. It was said that before Niutou Farong met Master Daoxin, birds would visit his hermitage and drop flowers on him. After his meeting with the master, this never happened again. Farong remained on Oxhead Mountain and, as students sought him out, he began to teach. Several generations later the practice community on this mountain, which traced it’s inspiration back to Farong, became known as the “Oxhead School”of Zen, and had a strong influence on the wider Zen movement. In the eighth century an Oxhead School teacher named Daoqin (or Faqin) established a practice center on Mt. Jing in the same Hangzhou region as Oxhead Mountain. Many students gathered there to study with him, including the monks Daowu and Tianran, to whom he was an important early influence. Both these students later went on to study with the great masters Shitou and Mazu, and eventually became influential teachers themselves. Master Mazu was known to have corresponded with Master Daoqin, and most likely recommended visiting Daoqin's place to some of his students. Another important Oxhead teacher was a Dharma brother of Daoqin's named Wuxing Fahai. He is thought by some scholars to have been the real author of the famous “Scripture from the Teaching-Platform of the Sixth Ancestor” that was traditionally attributed to Dajian Huineng, and contains both Huineng’s supposed teaching and his legendary autobiography. Boston: Wisdom Publications, 2000. pp. 38-42. ACCORDING TO TRADITION, Niutou Farong (594–657) was a student of the fourth Chinese ancestor, Dayi Daoxin. He founded the Oxhead Zen school on Mt. Niutou (near modern Nanjing City). Later Chinese historians would not acknowledge Niutou’s lineage as one of the principal traditional schools of Chinese Zen, perhaps because he is not known with certainty to have received Dharma transmission from Daoxin, or due to confusion about the origin of his school. Nevertheless, the Oxhead school flourished during the seventh and eighth centuries and continued up until the early years of the Song dynasty (around the end of the tenth century). The Oxhead school’s narrower interpretation of Bodhidharma’s Zen is distinct from the East Mountain school of the Fifth Ancestor, Daman Hongren. The Oxhead school is not known to have employed the chanting of sutras or to have emphasized the precepts. The modern scholar Yin Hsun attributes a classical Zen text known as the Discourse on Cutting Off Perception to the Oxhead school, pointing out that it is akin linguistically to the period when Niutou lived, and that its theme closely follows Bodhidharma’s teachings. The Oxhead school denied the possibility of objective knowledge more clearly than other Buddhist schools of the era. The fifth-generation Oxhead monk Xuanxu said, “Understanding is not understanding. Doubt is no-doubt.” The school also adhered to the Buddhist notion that the world is a creation of the mind. It expressed this theory in the “Wei Ming Lun” (“Only-Mind Doctrine”). Originally located in the area of ancient Jinling (modern Nanjing), the main temples of the school moved south during the eighth century to escape political upheavals. The fifth-generation Oxhead monk Faqin established a temple on Mt. Jing near Hangzhou in 742 that played an important role in Zen’s historical development in both China and Japan. Zen master Farong of Mt. Niutou came from Yanling in Run Province. His surname was Wei. By the age of nineteen he was versed in the classic Confucian histories, but later he read the Nirvana Sutra and thereupon penetrated the truth. Thereupon Niutou concealed himself on Mao Mountain, where he studied under a teacher and was ordained as a monk. Later, as he sat in meditation in a rock grotto north of Secluded Perch Temple on Mt. Niutou, a hundred birds with flowers in their beaks came to pay homage to him. During the Zhen Guan era [627–49], the Fourth Ancestor, Zen master Daoxin, saw a strange celestial sign in the distance and realized that an unusual person must be living on Niutou Mountain. He personally climbed the mountain to find the person and pay him a visit. The temple monk couldn’t reply. Daoxin then traveled into the mountains. There he found Niutou sitting upright in meditation, completely self-absorbed, paying no attention to Daoxin whatsoever. Farong had no answer. Standing up, he bowed. He then led Daoxin to a cottage that was surrounded by wild beasts such as tigers and wolves. Daoxin put both of his hands up in the air as if he were scared. Later, Daoxin wrote the word “Buddha” on Farong’s meditation seat. When Farong saw this he was horrified. Farong didn’t understand, so he bowed and asked Daoxin to explain his meaning. According to tradition, after Farong received this teaching from Daoxin and fully attained the way of Zen, birds no longer left flowers for him. Farong’s enlightenment left no special sign by which it could be recognized. Beyond this traditional story, a few dialogues involving Zen teacher Niutou are preserved in the classical records. The monk then asked, “In considering what is attained by common people and what is not attained by saints, where does the difference lie between this attainment and nonattainment? In the year 656 the magistrate Su Yuanshan invited Niutou to become the abbot of Jianchu Temple. The master tried to decline but was unable to do so. He then gave his genuine Dharma transmission to his great disciple Zhiyan, instructing him to continue the transmission to future generations. When he left Mt. Niutou he said to the congregation, “I’ll never return to this mountain!” At that time even the birds and beasts of the mountain wailed in mourning. Four large pauwlonia trees that were in front of Niutou’s cottage inexplicably withered and died during [June]. The next year, on the twenty-third day of the first lunar month, although not appearing ill, the master died. He was buried on Jilong Mountain. Taipei : The National War College in co-operation with The Committee on the Compilation of the Chinese Library, 1967, pp. 262-268. The Zen masters set little or no value on the siddhis or magical powers. This point is well illustrated in the life of Niu-t'ou Fa-yung (594-657). Niu-t'ou came from a scholarly family in the city of Yen-ling in modern Kiangsu. By the time he was nineteen, he was already well steeped in the Confucian classics and the dynastic histories. Soon after he delved into Buddhist literature, especially the Prajna scriptures, and came to an understanding of the nature of Shunyata. One day he said to himself, “Confucianism sets up the norms for mundane life, but after all they do not represent the ultimate Law. The contemplative wisdom of the Prajna is truly the raft to ford us over to the supramundane.” Thereupon he retired into a hill, studied under a Buddhist master, and had his head shaved. Later he went to the Niu-t'ou Mountain and lived all alone in a cave in the neighborhood of the Yu-hsi Temple. A legend has it that while he was living there, all kinds of birds used to flock to his hermitage, each holding a flower in its beak, as if to pay their homage to the holy man. Niu-t'ou was enlightened. Thereafter he emerged from his life as a hermit, and gave himself to the active works of charity and to the expounding of the Mahaprajnaparamita Sutra. Although the “Zen of Niu-t'ou” has been regarded by later Chinese masters as outside of the main currents of the School of Zen, his contributions to the elucidation of the philosophy of Nagarjuna are not to be minimized. His main teaching that illumination is to be achieved through contemplation of the Void spread to Japan through Dengyo Daishi (767-822). In China, the “Zen of Niu-t'ou” claimed adherents as late as in the eighth generation after him. Even at present, Niu-t'ou's gathas are cherished by Buddhists of all schools as an integral part of the Mahayana philosophy in China. The flies swarm to it buzzing all around. It is left all alone in its cold desolation. From the above samplings, one can see clearly the authenticity of the spirituality of Zen. With the sureness of their experiential insight, the Zen masters seem to have hit upon an unerring scale of values in spiritual life. Sensible consolations are not to be despised, but all the same they must be outgrown if one is to advance higher. Desolation is like the unleavened bread which may not taste so sweet but is of vital essence to one's life. There is still another point which is noteworthy. One's internal life must, of course, be hidden from the human eye. This was true of Niu-t'ou even before he had met Tao-hsin, as he was already a hermit. But, as Nan-ch'üan so clearly saw, your internal life must be so hidden that even the demons and angels have no way of espying it. When autumn comes, yellow leaves fall. When Spring comes, the grasses spontaneously grow green. This indeed is a glorious vision. These masters actually see the desolate land flourishing like the lily! Any student of comparative mysticism will see in the tradition and spirit of Zen the hallmark of authenticity. It is little wonder that Father Thomas Berry, a profound student of Oriental philosophy and religion, should have called Zen “the summit of Asian spirituality.” He certainly knows what he is talking about. How was it that before Niu-t'ou encountered the fourth patriarch Tao-hsin, the birds used to flock to him with flowers in their beaks, whereas after their meeting the auspicious phenomenon ceased? This koan is based on a passage in CCL vol. 4 (Taisho 51:226c-227b) that deals with Niu-t'ou Fa-jung, the founder of the Ox Head or Niu-t'ou school. Along with the Northern school, the Ox Head school was a successful early Zen movement in the seventh century, before the Southern school became dominant through the efforts of Hui-neng and his evangelical disciple Shen-hui. The Ox Head school was known for advocating a standpoint based on "formless precepts" that was influenced by the Madhyamika philosophy of emptiness, and also became a factor influencing Tendai Buddhism brought to Japan by Saicho. The influence of Zen on the Japanese Tendai sect was short-lived, however, and it was not until the thirteenth century that Zen began to flourish in Japan based on the Soto teachings of Dogen and the Rinzai teachings of Eisai. As with the Northern school, the Ox Head literature was close in style to the hagiographical materials in the monk biography texts. This case emerged from a fascinating narrative about the encounter between Niu-t'ou, who was then a hermit, and fourth patriarch Tao-hsin, who came to visit his mountain hut near the northern cliff of the temple. Every day, hundreds of birds flocked to Niu-t'ou with flowers in their beaks, as a sign of nature paying homage to the meditation master. Also, a huge snake once came into his hut and stayed for a hundred days without harming the monk. Although he was residing some distance away, Tao-hsin became aware of these auspicious phenomena and traveled to check out the master who was receiving so much adulation. When Tao-hsin arrived in the area, he asked a monk if there was a "man of Tao" in the vicinity, and was told that on the mountain one would be hard-pressed to find someone who was not a man of Tao. But when asked to identify such a person in a more specific or concrete way, the monk was at first speechless. He then suggested that Tao-hsin venture another ten miles to find "Lazy Jung," so called because he did not bother to rise from his sitting position to greet visitors. «L'école tch'an de Nieou-t'eou», dans Tch'an/Zen. Racines et floraisons, Paris, éd. Les Deux Océans, coll. « Hermès. Recherches sur l'expérience spirituelle » (no 4),‎ p. 103-125. «Nieou-t'eou Fa-jong», (tiré de la Transmission de la lampe), traduction de sa biographie dans Tch'an/Zen. Racines et floraisons, Paris, éd. Les Deux Océans, coll. « Hermès. Recherches sur l'expérience spirituelle » (no 4),‎ p. 125-136. Le maître de dhyana Fa-jong (582-657), de son nom de famille Wei, était originaire de Yen-ling dans la préfecture de Kiun. A l'âge de dix-neuf ans, il avait déjà étudié et pénétré à fond les classiques confucéens et les textes historiques. Alors qu'il étudiait le long soûtra de la Prajnâparamita, il eut la compréhension de la vacuité véritable. Un jour, il dit soudain en soupirant : « Les livres confucéens n'exposent pas la doctrine suprême, seule la claire vision donnée par la Prajna peut nous faire voguer hors de ce monde ». Après quoi, il mena une vie d'anachorète sur le mont Mao, où il devint moine bouddhiste. Il se rendit ensuite au mont Tête de buffle (Nieou-t'eou), et résida dans une grotte au pied d'une falaise située au Nord du temple Yeou-hi. On pouvait y voir l'étrange spectacle des oiseaux venant lui offrir des fleurs. «Extinction de la contemplation», traduction du Kue-kuan lun de Nieou-t'eou, dans Tch'an/Zen. Racines et floraisons, Paris, éd. Les Deux Océans, coll. « Hermès. Recherches sur l'expérience spirituelle » (no 4),‎ p. 136-155. "Soyez sans point de vue, pas même celui d'être un homme"
La grande Voie, Vide profond, immensité silencieuse, obscure et sublime, échappe à la connaissance de l'esprit et est inexprimable par les paroles. "Qu'est-ce dont que l'esprit ? En quoi consiste l'apaisement de l'esprit ? - Vous n'avez nu besoin de poser l'esprit, encore moins de le contraindre s'apaiser; en cela consiste l'apaisement. - S'il n'y a pas d'esprit, comment connaitre la Voie ? - La Voie n'est pas une chose à laquelle on puisse penser, comment concernerait-elle l'esprit ? - Si l'on ne peut y penser, comment la garder constamment présente ? - Penser, c'est donner existence à l'esprit. Donner existence à l'esprit, c'est tourner le dos à la Voie. Si l'on ne pense pas, l'on est sans esprit. Sans esprit, l'on demeure dans la Voie véritable. - Les êtres vivants ont-ils un esprit ou non ? - Considérer que les êtres vivants ont un esprit, c'est être dans la vue inversée. C'est uniquement parce qu'un esprit est posé au sein du vide d'esprit, que les pensées fausses apparaissent. - Qu'est-ce donc le vide d'esprit ? - Etre sans esprit, c'est être vide d'objet. Le vide d'objet correspond à la nature vierge, laquelle n'est autre que la grande Voie. - Comment éliminer les pensées fausses des êtres ? - Posséder les notions de pensées fausses et d'élimination de ces pensées, c'est n'avoir toujours pas abandonné ces pensées fausses. - Peut-on, sans les éliminer, être en union avec le principe de la Voie ? - Parler d'être en union ou pas, c'est n'avoir toujours pas abandonné les pensées fausses. Yuan-men se leva et demanda : "Comment peut-on marcher, rester debout, assis ou couché, sans conserver la notion d'un corps ? - Il vous suffit de marcher, de rester debout, assis ou couché, pourquoi poser la notion d'un corps ? - Mais comment peut-on réfléchir sur le juste principe sans poser cette notion ? Tant que l'on s'accroche à l'existence d'un esprit, ce dernier existe même en l'absence de réflexions. Mais si l'on comprend ce qu'est l'affranchissement de l'esprit (wou-sin), il y a affranchissement de l'esprit même lorsque les réflexions apparaissent. Pourquoi ? Parce qu'il en est de même que pour le maître de dhyana assis dans le calme et laissant les pensées apparaître, ou le vent violent soufflant de toutes parts sans un esprit." «L'inscription de l'esprit», traduction du Sin ming (attribué à Nieou-t'eou), dans Tch'an/Zen. Racines et floraisons, Paris, éd. Les Deux Océans, coll. « Hermès. Recherches sur l'expérience spirituelle » (no 4),‎ p. 156-164. Dont l'esprit ne saurait épuiser les ressources. Et la non vacuité est vacuité réelle. ** Henrik H. Sørensen a dániai Koreai Tanulmányok Intézetének igazgatója. A tudat természete nem-keletkezett. Miért kell ezt tudni? Alapjában véve egyetlen jelenség sincs; hogyan is lenne szennyezettség vagy megtisztulás? Az elmúlás nem jön vagy megy; nem számít, mennyire keresed, soha nem ismered meg! Amikor minden tétlen, a ragyogó csend önmagától megnyilvánul. Mint üresség jelenik meg; így megérted: jobb feladni a zavaros tanokat. A körülmények világos megkülönböztetése: a sötét és rejtett megvilágítása. Ha a Buddha-tudat zavart, akkor egyetlen tantétel sem képes azt rendbe tenni. Véletlenszerűen jön és megy: mi értelme kifárasztani önmagát? Az élet tulajdonsága: nem-keletkezett; ezáltal megvilágítja az egységet. Ha célod elérni a tudat tisztaságát, akkor szorgalmasan gyakorold a tudatnélküliséget. Ha nincs semmilyen tudatfolyamat, akkor az mindennél csodálatosabb! A „nem-tudom” által megismered a Tant; a „nem-tudom” megismeri a lényeget. Felfogod a tudatot, fenntartod a csendet: attól még nem hagyod el az érintettség betegségét. Felejtsd el élet és halál kapcsolatát: akkor és ott az alapvető természet megnyilvánul. Magyarázat nélküli nagy rendezőelv: eléred, ha nincs elutasítás, ha nem korlátozod önmagad. előtte egyik sincs; a folyamat az „egyik sincs”. Ne törekedj megvalósítani a Bölcsesség Tükrét: annak lényege önmaga csodás üressége. A gondolkodás keletkezik és elmúlik; sem előtte, sem utána nincs megkülönböztetés. Ha az előző gondolat felszámolja önmagát, akkor a következő gondolat már nem jön létre. A három világban egyik sem számít: sem a tudat, sem a Buddha. Minden élő lény a nem-tudat terméke: általa kelnek életre, tőle függ a sorsuk. A köznapi és szent megkülönböztetése okozza a jólét bosszúságait. Mindig számolgatsz és tervezgetsz, hogy megleld az igazságot: hátat fordítasz a valóságnak. Ha véget vetsz a (lét és nemlét) két szélsőségének, áttetsző, ragyogó léted lesz. Nem szükséges gyerekes gyakorlatok szorgalmas gyakorlása. Észlelés által tudásra teszel szert; ha látod a létforgatag hálóját, már kint is vagy. Nincs mit látni, egy sötét szobában nincs mozgás: ez a Felébredés. Az észlelésben nincs tévedés, a felébredésben nincs áttetsző ragyogás. A rengeteg forma mind valóságos: megvan bennük a legfőbb jellegzetesség. Jövés, menés, ülés, állás: jól ismered. Biztos pont hiányában honnan jön és hová tart? Nem áll össze és nem esik szét; nem lassú, sem gyors. Maga a ragyogó nyugalom: és mégis szavakba önthető! Ha a tudatban nincs semmi attól különböző, akkor nem kell a vágyakozást felszámolni. Mivel természete üres, eltűnik, ha szabadon mozoghat. Nem tiszta, sem szennyezett; nem sekély, sem mély. Eredetileg nem a múlt, sem a jelen: éppen most! Éppen most nincs „nem-tűrés”, ez az eredeti Buddha-tudat. Ha belekapaszkodsz az eredetbe, akkor az megjelenik. A megvilágosodás eredetileg van, ezért nem szükséges fenntartani. A bosszúságok alapjában véve nem léteznek, így nem szükséges megszabadulni tőlük! A bölcsesség önmagától felragyog, és a rengeteg (tünékeny) jelenség visszatér (a forráshoz). Nincs visszatérés, sem elfogadás. Szüntesd meg a véleményt és felejtsd el a fogadalmakat! A négy Erény nem-keletkezett, a három Test alapjában véve létezik. A hat Gyökér körülményektől függ; a tiszta észlelésnek semmi köze a tudatossághoz. Akkor a tudatban nem lesz semmi elégtelen: a rengeteg ok közvetlenül összhangba kerül. A tudat és az érzés alapjában véve egy tőről fakadnak: egymást nem zavarva, együtt léteznek. A nem-keletkezett összhangban van a jelenséggel: együtt léteznek és elpihennek a sötétben. Megvilágosodás a nem-megvilágosodottból jön, így a megvilágosodás: nem-megvilágosodás. Haszon és veszteség: az érme két oldala. Akkor mit mondanál jóról és rosszról? Minden, aminek oka van, eredetileg a nem-keletkezett terméke. A Tudat nem megismerés: sem betegség, sem orvosság nem befolyásolja. Ha zavar, hagyd a dolgokat folyni a maguk útján: Felébredésben nem különböznek (énedtől). Alapvetően semmi sem megismerhető; akkor vajon mit utasítasz el? Létezésről beszélsz: behódolsz az ártó szellemeknek. A szavak üres képet hoznak létre! Ne szüntess meg érzést. Az egyetlen, amivel foglalkozz: hogyan szabadulj meg nézeteidtől! A nézetek a nem-tudat által megszűnnek; a tudatállapotok a nem-cselekvés által megszűnnek. Nincs értelme bizonyítani az ürességet: az önmagától felragyog! Élet és halál kioltása: a beható Tudat belép a végső törvényszerűségbe. Csak nyisd ki a szemed: ezek a formák! Mozdulj együtt a felmerülő körülményekkel! A tudat elnyugszik a nem-körülményekben: a körülmények elnyugodnak a nem-tudatban. A tudat megszünteti a körülményeket, a körülmények együtt mozdulnak a megszüntetéssel. A tudat elnyugszik: a körülmények elnyugodnak. Ne engedd el azokat! Ne tartsd fenn azokat! Mindkettő elnyugszik a nem-keletkezésben: nyugodt tisztaság, üres ragyogás! A felébredés megjelenik, mint az árnyék a tudat folyamatosan tiszta víztükrén. Az erényes természete olyan, mint az együgyűség: „ez” és „az” nem különül el. Sem áldás, sem gyalázat ki nem mozdítja, de meg sem állapodik. Minden ok elnyugszik: nincs miért aggódni! Nincs megkülönböztetés: az örök világosság sötét, a végtelen éjszaka világos. Kívülről csökönyösnek és butának tűnik, ám a tudat szabad és a valósággal azonos! Elégtelen feltételek ki nem mozdítják; megvan a hatalma a megvalósításhoz. Nem a látó, sem a látott: így a nem-látás minduntalan megnyilvánul. Mindent felfog, mindig mindenütt jelen van. A gondolkodás zavart szül, a zavar érzelmeket. csak még inkább cselekvő lesz. A rengeteg jelenségnek nincs alapja: csak az egyetlen Kapu van. A kapun sem bejönni, sem kimenni nem lehet; sem nyugalomhoz, sem zavarhoz nem vezet. A Hallgatók és Ön-Buddhák bölcsessége által ez nem megismerhető. Valójában semmi nem létezik: a felülmúlhatatlan bölcsesség van. Körülmény: igazából üres. A tudat nem képes kimeríteni azt. Az igazi megvilágosodás nem megvilágosodás; az igazi üresség nem üres! A három világ összes Buddhája ezt a tant hirdeti. Ez a tanítás porszem méretű: annyi világ van, ahány homokszem a Gangesz medrében. Nincs semmi dolgod: a békés tudat ügyek nélkül marad. A békés tudat nem elfoglalt, s az üres ragyogás önmagában megnyilvánul! A csendes nyugalom nem-keletkezett: szabadon kószálsz mindenfelé. Bármit is teszel, semmi nem akadályoz. Mozgásban és nyugalomban is minden egyforma. a nem-megjelölt ragyogó parkja, és az ellobbanás tiszta városa. Minden ok esetében: ne törődj a következménnyel! Ez a felébredés minőségéhez hasonlatos. Tanításhoz ne ácsolj emelvényt, inkább szunyókálj egy (félreeső) üres házban. Boldogságra lelsz az Úton: van elég hely vándorolni az igazi Valóságban. A négy Erény és a hat Túlpartra Juttató mind-mind az egyetlen járműhöz tartoznak. Ilymódon a tudat nem jön létre; akkor minden jelenség hibátlan.